Absolutely best location in neighborhood. Unique view of Copenhagen Skyline. 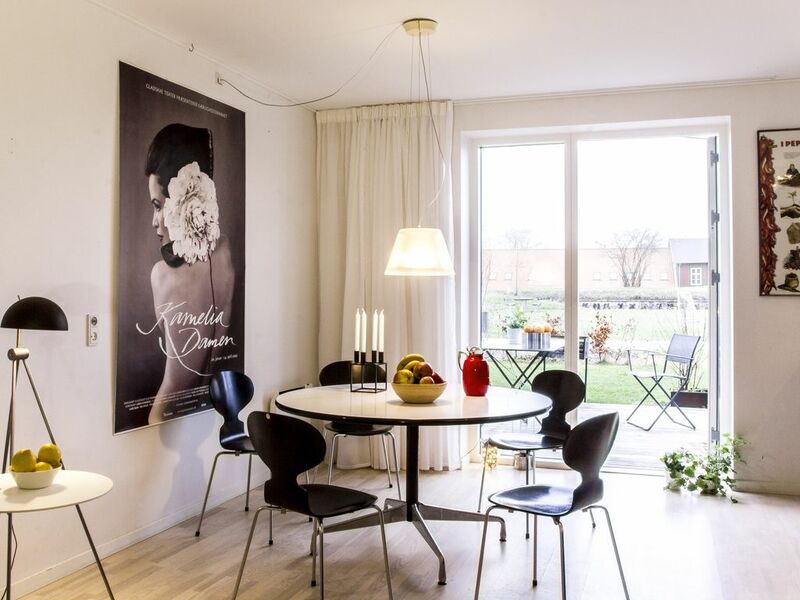 Nice nordic minimal design and exclusive furnished. Very nice and relaxing neighborhood, with inspiring features nearby. Gourmet reataurants, marina, sports facilities, harbor swimming and interesting urban nature, træffer area a unique and interresting place to escape from the nearby City Center. All space and equipment is available, and part of the closets will be available. House is on three floors. - Acees two two private teraces, with barbeque grill and outdoor furniture. - Bedroom with two full size single beds, closet and bay window. - Bedroom with two full size single beds, one bed can expand two full size double bed. - Living Room with big bed, TV and working table. Optional full-size bed. The property was clean, the beds comfy, and the location easy to explore the city. The owners answered questions before we arrived and were kind to check in and quickly reply to questions while we were there. A great place to stay for families! Very spacious and well equipped. Easy to get into centre of Copenhagen but lovely to be in a quiet area. Owners very helpful and answered our emails very promptly. We loved our stay at Charlotte and Lars place. The flat is in the middle of a building with 12 or so other identical flats, and there are 3 other similar buildings around it. The result can seem a bit tight, we were concerned about it before getting there, but we didn't even notice it once we were there. The area is super nice, its 3 minute walk to bus 9A, which will comnect to everything else. Being a residential area, there isn't much nearby in terms of restaurants, but we walked about 15 minutes to a restaurant in the nearby marina, and being near the bus, you can get anywhere else easily enough. There is a trampoline and playset area for kids, and there were several families out every night so the kids could all run off and play, letting the adults sit on the patio to enjoy the weather while still being able to watch the kids. The flat was great, good stocked kitchen, washer/dryer, and enough sleeping options for the 6 of us. Downstairs is the kitchen, bathroom, and patio. The first floor had two nice rooms with 2 beds, and the second floor had the master bedroom and a sitting area with TV. All the beds were SUPER comfy. With 6 people, the single bathroom wasn't so much of an issue as others have noted. But we did find the flat to be warm, and opening the windows cooled it off pretty well. Overall, we'd absolutely stay here again. It was resonably priced compared to others in the city center, and the family neighborhood was an added bonus for our kids (and therefore us too!). This home was a great base for our trip to Copenhagen. It was so warm, super comfortable and spotlessly clean and we couldn't have asked for a warmer welcome. Lars (the owner) met us at the property on arrival and showed us around and gave us lots of local information to make the most of our stay. There is a great little cafe nearby which was good for breakfast and the water bus has a stop not far from that which is the perfect way to get in to Nyhavn. There is also a bus stop very close by which has buses every 9 minutes which get you in to the city centre. We really couldn't have asked for a better base or a warmer welcome from Lars and his family. It's the perfect spot if you are visiting with children as there is plenty of space for them and you're guaranteed peace and quiet after a busy day of sightseeing. We wish Lars and Charlotte lots of luck with their venture. The town house has a unique location. Close to city center and in the middle of urban nature and waterfront. Lars is a wellknown architect, and kill unseen his skills two chose the absolutely best location in the neighborhood. Copenhagen is known for its bicycle culture, and if you are ready to clean bycycles, you will enjoy the proximity to the city center, combined with wonderfull rides along the harbor front. Take your bicycle onboard the harbourbus, and connect to all major tourist attractins inom a comfortable and shot ride.